Ledger is a company based in France that develops and manufactures security products & services in the cryptocurrency industry. The company (Ledger) was established in 2015, and focuses on security-related products for both consumers and businesses. Since 2015, the most popular category of their product offering is cryptocurrency hardware wallets. Ledger manufactures a few different types of hardware wallets, but among them, the Ledger Nano S leads the pack in terms of popularity. It has become one of the most popular choices among cryptocurrency owners due to the security features it offers and, in terms of pricing, it’s also very affordable. The Ledger Nano S is pretty similar to other hardware wallets on the market in the sense that it features a small device with an LED screen that can be connected to any computer via the USB port. Sensitive information like your wallet’s private keys are stored securely on the Ledger device and kept offline until it is connected to a computer. This information is only unlocked when the device is plugged in and the one-time PIN code is entered in one of the Ledger wallet apps. 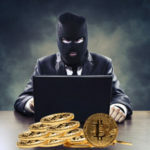 That means any funds stored on your Ledger are are kept offline and secure, and are not accessible unless the device is plugged into your computer. 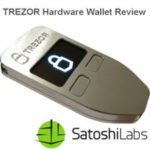 Unlike other comparable hardware wallets, such as the TREZOR, which has its own custom user-interface, all Ledger wallets utilize different web-apps for each supported currency. They are called Ledger Apps and are free to download as Google Chrome applications. The main Ledger App is called “Ledger wallet Bitcoin & Altcoins” which supports Bitcoin along with several other tokens and coins that are not built on the Ethereum blockchain. The Ledger Nano S is simple to use and doesn’t require a whole lot of technical knowledge of Bitcoin or cryptocurrency. All of the information you need to set up your wallet is included on pamphlets in the packaging. So long as you read the instructions and can download the appropriate apps on your computer, you’ll be able to easily use the Ledger wallet to send, store and receive cryptocurrencies. 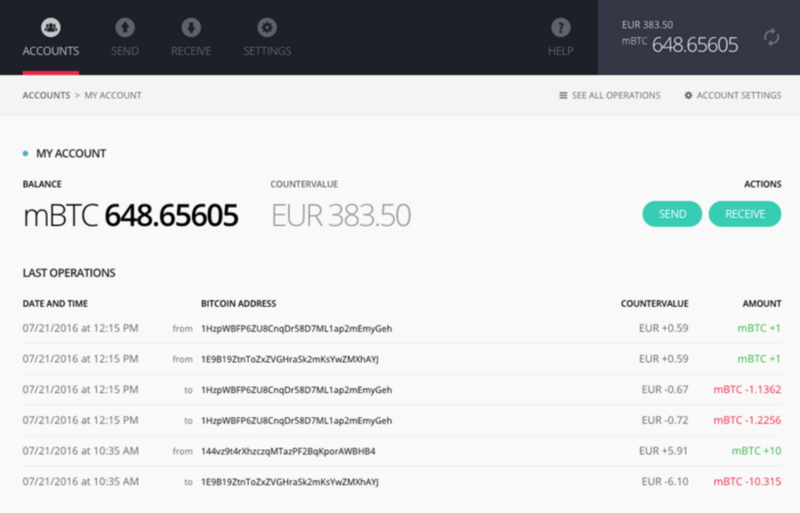 The wallet applications made by Ledger are user friendly, featuring straightforward buttons for “send” and “receive”. On the wallet homepage, the current wallet balance is displayed with the current equivalent value in fiat currency based on your account settings. 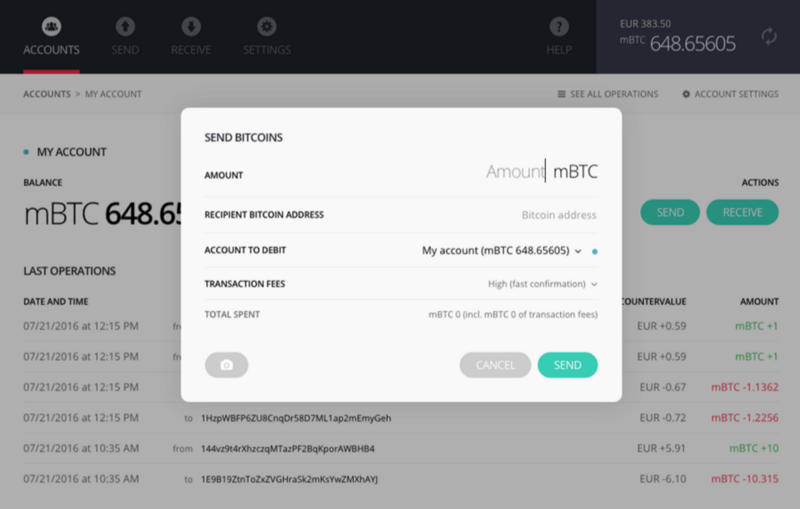 It is worth noting that for Bitcoin, the interface uses mBTC as a value and not BTC. 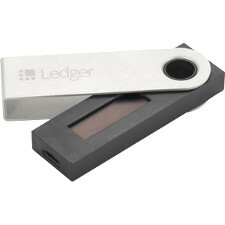 The Ledger Nano S is available directly from Ledger at https://www.ledgerwallet.com/ and is priced extremely competitively to other comparable wallets. On Ledger’s website, the Nano S wallet sells for €79 and now includes free shipping. They ship to over 50 countries worldwide, including the United States, United Kingdom and France. You can upgrade to UPS Express shipping for an additional fee of roughly €20 depending on the destination. While its inner-workings are made of plastic, the Ledger Nano S has a metal outer casing which makes it a bit more durable than other hardware wallets. The casing swivels open to reveal its LED screen, and while closed it can protect the screen from cracking. The Nano S is roughly the same size as a standard USB storage device, and can fit easily in your pocket or a desk drawer. Just like the TREZOR, it features two small buttons for confirming or denying information on the screen. Purchasing a Ledger hardware wallet is simple and can be done in the same way that you would buy any other product online. Just go to the Ledger website, add the products you want to purchase to your cart and complete checkout. At this time, Ledger accepts several major credit/debit cards including Visa and Mastercard, as well as PayPal and of course, Bitcoin. Depending on the shipping method you choose, it can take between 3-5 days (Express) or 7-21 days (Standard) to receive delivery. Once the Ledger arrives, you’ll have to set it up by connecting it to your USB drive. From there, just follow the instructions that were included in the box and confirm the information via the screen on your Nano S. Upon setup, you’ll receive a recovery seed which consists of 24 words. The seed will enable you to recover any funds stored on your wallet’s private key if the device ever becomes lost or stolen. For this reason, it’s important to always keep your recovery seed in a safe place. As we briefly went over earlier, the Ledger Nano S works in conjunction with web-based Google Chrome applications. This enables the Ledger to support a wider range of coins compared to other hardware wallets. The specific app you use will depend on the currencies you are storing. If using Bitcoin with the Ledger Nano S, you will need to install the Ledger Wallet Bitcoin app in your browser. It can be downloaded directly from the official Ledger website. Anytime you want to send or receive cryptocurrency using your Ledger all you need to do is open up the appropriate app in your browser. Like other hardware wallets, the Ledger Nano S lets you set your own custom TX fee for outgoing transactions. Ledger was among the first companies to focus solely on cryptocurrency security products for both individuals and businesses. Established in 2015, they have cemented their place in the cryptocurrency industry as a leader in security and consumer products. Today, they have a team of over 80 employees dedicated to improving Ledger’s existing products as well as creating new products and services for the future.